The scene inside the al-Fath mosque. Egypt’s bloody crackdown on supporters of ousted President Mohamed Morsi continued on Saturday as security forces stormed Cairo’s al-Fath mosque, where hundreds of members of the Muslim Brotherhood had barricaded themselves after Friday’s “Day of Rage,” which left 173 people dead. 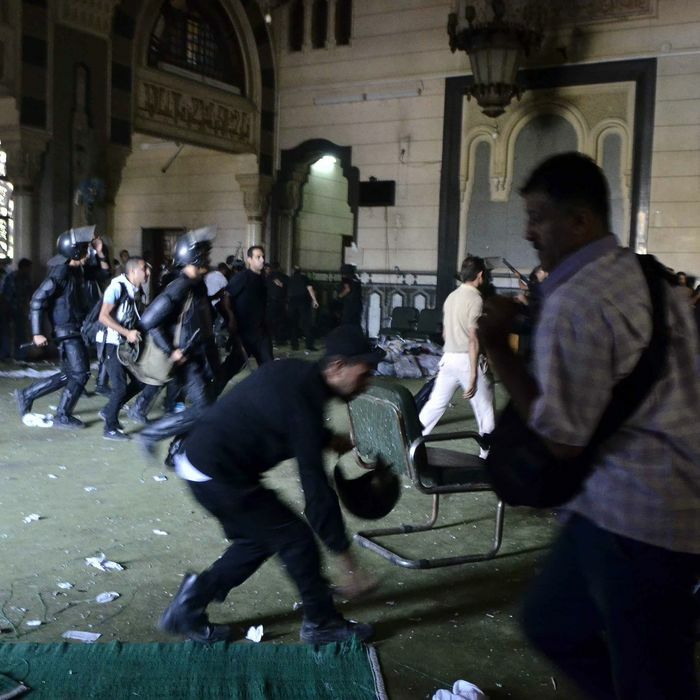 The clash began overnight after police and the military surrounded the mosque, claiming to be concerned that it would become the site of a sit-in like the Wednesday pro-Morsi protests during which over 600 people were killed. The BBC reports that security forces shot tear gas into the mosque, and multiple news outlets report that they exchanged gunfire with a man standing in the building’s minaret (it’s not clear who fired first) before moving inside and removing the protesters, many of whom were then arrested. Meanwhile, a government spokesman announced on Saturday that interim prime minister Hazem el-Beblawi has proposed the dissolution of the Muslim Brotherhood, which was banned from Egypt in 1954 but registered as a nongovernmental organization in March. (It also has a legally registered a political arm, the Freedom and Justice Party, following the 2011 downfall of Hosni Mubarak.) Later, el-Beblawi adviser Mostafa Hegazy held a press conference during which he said Egypt faced “war by the forces of extremism” and promised to fight “extremism and terrorism through security measures.” The Muslim Brotherhood has vowed to keep protesting.